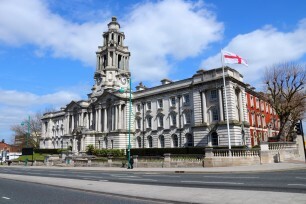 Stockport Town Hall is a key landmark in the Borough and is the epitome of Edwardian elegance and ambition. Despite being the home to numerous council offices, the Town Hall hosts numerous events including ballroom dancing and award presentations. The imposing Italian entrance is a must see, as is the Wurlitzer organ that is also in the same room. The organ has had a nomadic history, having previously been housed in Manchester's Paramount Theatre and Free Trade Hall. However it has been in Stockport Town Hall since 1999. Stockport Town Hall is also home to the Stockport Symphony Orchestra, who play concerts on a regular basis.